Gluten Free Pumpkin Spice Cookies – This Girl Loves to Eat! As I was reviewing the recipes I’d be making for Thanksgiving weekend gatherings this year, I realized that someone likely to eat at least one meal at my house is gluten intolerant and wouldn’t be able to share the best part of dinner: dessert! Luckily I had a recipe that was easily converted to gluten free, whew, crisis averted! On low speed slowly add the dry ingredients until well incorporated and dough forms a ball. Divide the dough in half and put into 2 large Ziplock bags. Flatten to a large disk and put both into the refrigerator for at least 30 minutes. Once dough has chilled place first disk on a lightly floured surface (MAKE SURE YOU USE THE GLUTEN FREE FLOUR), roll out to about 1/4″ and cut into Turkeys, Leaves, Footballs or any other fall shape. 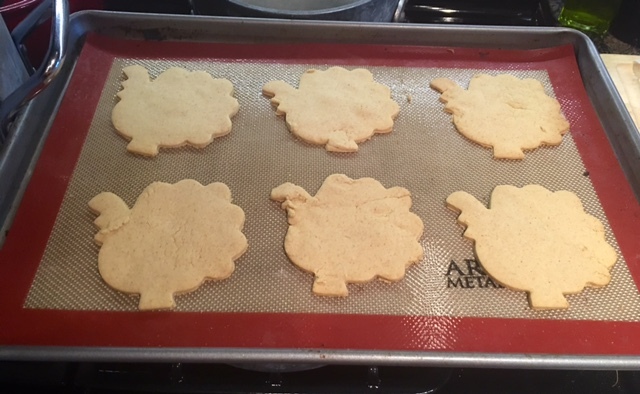 Place on a cookie sheet with a silicone liner or parchment paper and then throw the pan in the freezer for a couple of minutes to help cookies keep their shape when you bake them. Repeat process with what is left of first disk then the second disk until you have used all of the dough. Bake for 9-12 minutes (until lightly browned on the bottoms and starting to brown on the tops) depending on your oven and the thickness of your cookies. Remove cookies from the oven. Allow to cool on pan about 1 minute then remove to wire racks to completely cool. Do not leave on the pan too long or the cookies might start to lose their shape. When completely cool ice with Royal Icing or pre-made cookie icing and enjoy. Posted on November 25, 2015 by ls1228Posted in Baking, Dessert, Gluten Free, Holidays, Recipes, TreatsTagged Krusteaz, pumpkin spice, Royal Icing, tailgate, Thanksgiving, Turkey, Ziplock.